Representatives from Rustomjee Academy for Global Careers in India visited the city and met with key figures from the University. 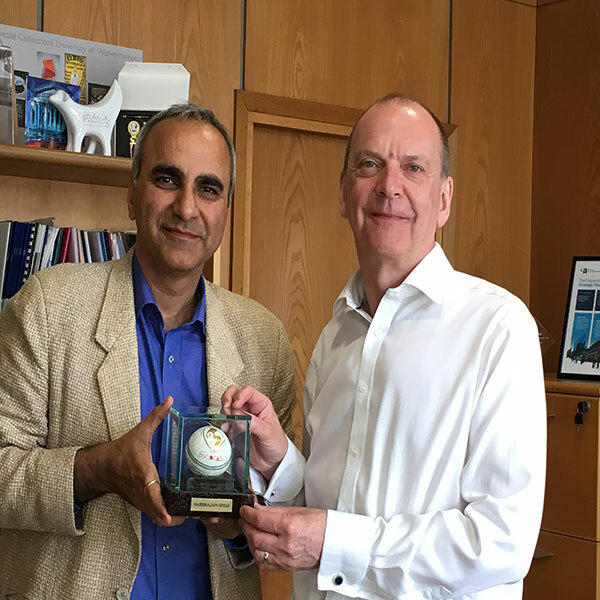 Visitors Mr Kavi Lutha, Vice President and Winny Rawal, Project Head for the University of Wolverhampon partnership, met with Vice-Chancellor Professor Geoff Layer. They presented Prof Layer with a cricket ball signed by Indian international spin bowler Harbhajan Singh. The visitors also met representatives from the International Office, Graduation Office, Registry and members of the Faculties of Science and Engineering and Social Sciences. A partner since October 2017, Rustomjee Academy for Global Careers offers five University of Wolverhampton programmes: civil engineering, business and HR, leisure and hospitality, automotive engineering and electronics and telecommunications engineering. Further information about the University’s International work.